Aerofiles is the Internet's most comprehensive, non-commercial, free-access web site dedicated solely to the aviation history of North America and the airplanes that have graced our skies for more than a century. There are no ad banners, pop-ups, Java scripts, Frames, Applets, cookies, music or sound effects, or animations between the viewer and nearly 400MB of data and information. Its popularity is apparent by a current (March 2008) traffic count averaging nearly 30,000 hits and about 11,000 page-vsits each day. 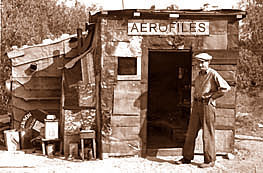 This is the starting place for anywhere in the wonderful and sometimes weird world of aviationmilitary, civil, and commercialin North America from 1903 to now, with some 400 "pages" of aeronautica linked on the Hangar Page as major categories, which in turn contain links to specific subcategories or features listed on the Index of Pages. With so much information to present, we use many abbreviations and arcana to conserve space. If you are new here it would be wise to read our codes so you won't be wondering what "ff:" or "(>125)" means, or what a "ChwMAm" is. You'll catch on right away. We did. We were relaxing over a glass of dry sherry after a busy day, and I happened to ask Frank if he'd ever heard of an airplane with the amusing (to me, at least) name of "Crouch-Bolas." Browsing through his bookshelves, he actually found a picture of that creation in an old magazine and handed it to me. This led us into musing about the forgotten birds of history, and how many of them there must be, and how many of them actually contributed some important threads to the enormous tapestry of aviation. We both lamented about how much historical chaff was lost in the veils of time, and how much information had become misinformation because of failing memories, folklore, and a lack or unavailability of records and documentation. "You know?" he said. "Someone really should document all those obscure things before they're lost forever." ADF, once the flyer's familiar "Automatic Direction Finder," seemed a fitting acronym, and the working title in 1992 became ADF: Aero Data Files. The original intent was to produce a set of books that would provide basic information on American civil aircraft production since the Wrights' historic flight in 1903. For various reasons, mainly its size, the book fell by the wayside, and when Internet happened along I decided to put everything up in the sky for all to share, where it would do the most good, retitled Aerofiles. How much data to present was a problem. Every flying machine ever produced had a story behind it, a human drama full of joys and frustrations, sometimes tragedy, and to get into this depth for what I initially estimated to be four to five thousand types of aircraft would take me well beyond an expected lifespan. So, I decided it would be best to give basic information, necessarily limited because of Webspace, and to feature as many photos of planes as I could findprimarily obscure ones first, since most everyone knows what a DC-3 or Cessna 172 looks like. Basic information sometimes proved to be very basic. Found data were bare-bones in many cases, nonexistent in othersat least for me. Certainly information was out there somewhere, but short of telephoning everyone in the USA to ask who knew what about what, I was limited to accessible facts from books, periodicals, and personal contacts. Aircraft with little or no found data are included herein with a hope that someone, some day, might come forward with documented information. I also decided to limit research to heavier-than-air, manned, powered aircraft as the representative part of aviation. That includes what is perhaps the single most undocumented segment, home-builts (weren't the Wright Brothers essentially home-builders? ); however, these are at the mercy of often scarce information and exclude those that were merely existing designs renamed. Helicopters, while a field unto themselves, are in since there was so much interleaving of technologies and individuals, but gliders and gasbags, space vehicles and missiles are out. I lost count of paragraphs in mid-1999, but it then was about 14,000, which roughly translated into more than 10,000 entries, discounting incidental paragraphs, and Aerofiles has grown considerably since then. In 2003 a computer whiz estimated that it was roughly the print equivalent of three Manhattan telephone directories! Yet Aerofiles is not complete, nor will it ever be. As long as new aircraft appear, they need to be documented for history. Presently there are glaring blank spots. Some entries are devoid of any info only because they were added to reserve their placethey're going to have to wait until data are found and added. Fortunately, I have as traveling companions in Aerofiles some friends and "stringers" whose expertise in aviation history I envy and respect. Yet there is always room for more people with substantial subject knowledge who recognize the educational value of Aerofiles and wish to help in specific areas. Be aware that the pay is lousy, but the hours are long... Email address is aerofiles@comcast.net. Always needed are photos, or clean 'Xerox' copies, of unusual, obscure, and one-off creationssharp 100-150 dpi JPEG scans are eminently usable, but limit width of those at 6 to 10" for bandwith conservation. Photos loaned for scanning will be returned in a timely manner. In all cases we wish to avoid copyright infringment, so kindly provide sources with pictures, even if they are generic (USAF, USN, manufacturers, etc).